After the acquisition of PV Automotive and Optimal, this news came as a surprise. Already the acquisition of Optimal caused a few raised eyebrows in the industry, but a possible sale of the entire parts wholesale business would almost be like an earthquake. Stahlgruber GmbH is currently a well-positioned car parts distributor, a reliable partner, solid and equipped with a high level of implementation competence. In its current situation, the market does not necessarily require such a step either, because the effects of new technologies and digitisation will become apparent on the aftermarket much later than it is the case in the new car trade. In addition to many positive points, there are undoubtedly also deficits at Stahlgruber, for example in internationalisation, which has not always proceeded as planned, see China, the Balkans or northern Italy. There are a number of questions. I.a., what about mgmt. competences, strategy options, personnel capacities to drive forward the changed future requirements in the aftermarket, such as internationalisation and the transition to digitalisation? But these are all problems that could be solved with less drastic measures. So what could be behind this? This article is not intended to fuel speculations. The rumour mill is churning again in the aftermarket, because there is nothing people love more than reopening subjects. Rather, it is intended to shed light on factual backgrounds, options and possible outlooks. The near future will show which option Stahlgruber will take. The fact is that the ongoing consolidation process in IAM distribution shows unmistakably that the automotive aftermarket is also facing a considerable process of change, and not only in the automotive industry. With the announcement, Stahlgruber could simply want to scour its own market value. On the other hand, this could also be due to concrete strategic future considerations. For example, the company could be looking for international connections and therefore needs capital and know-how. Or the company is looking for a strong partner with whom to master the future. This consideration would take into account future aftermarket developments such as electrification, digitization (e.g. Connected Cars and workshop routing). This applies equally to the entry of new market participants into the independent aftermarket, such as car manufacturers (PSA, Renault, etc.) and intermediates such as insurance companies and large fleets. With a strong partner at their side, it would be easier to face economic developments as well as the progressive decline in gross profit and the increased significance of technical know-how. Especially the rapid development in digitalization and software is becoming increasingly important, also in the independent aftermarket. The majority of workshops already has a good digital infrastructure, which potentially allows them to buy digitally at a lower price than analogue. Especially the digital purchasing of workshops (IAM/OES) on web shops and marketplaces is growing in the background. An erosion process is underway here. It would certainly be a good idea to look for partners for the digitization process (marketplace development) in order to use the connected workshop concepts and integrate them into this digital process. In this context, this means that drivers won over for digital are routed to preferred workshops, like Tyre 24 has been demonstrating for years for tyres, or Amazon would be able to implement quickly. On the other hand, the German „analogue IAM distribution“ will not generate any significant growth in the future. This is supported by facts such as the fact that parts manufacturers are cutting back on their sales force, bringing down their marketing, etc.... The time has come when the established parts manufacturers draw a line on distributors in price negotiations for margin reasons. According to the principle: “So far and no further”. A reorientation in such a changing aftermarket requires investments, i.e. capital and also know-how. Who Would Be a Possible Buyer? 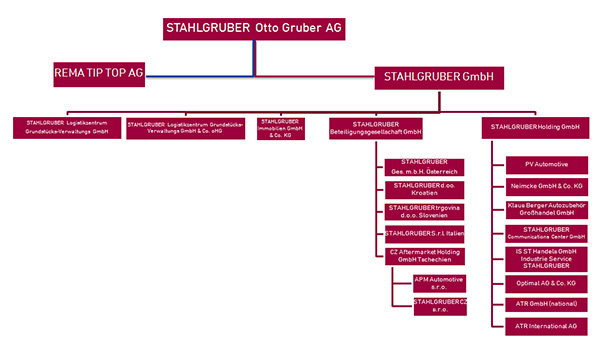 If the holding company decides to sell the subsidiary Stahlgruber GmbH, there are various options. Pure financial investors or foreign parts traders (USA, Canada, China), car manufacturers or parts manufacturers, either individually or as a consortium. Especially for the second and third lines of the parts manufacturers applies that if Stahlgruber can no longer be a partner, they will look for new ways. Minority stakes are also being considered, for example the American parts trader LKQ recently acquired a 26.5% stake in the Swedish distributor Mekonomen. However, not all scenarios are likely. For example, Chinese car and parts manufacturers have long since gone different ways than in Europe. The “old fashion supply chain” is too old-fashioned for them; there are simply too many sales levels. The Chinese rely on online, i.e. directly from the manufacturer to the driver, 4 to 5 warehouses and direct delivery to the workshops. Connected Cars makes it possible in the future. Online companies such as Amazon would probably only be interested in a few outlets in metropolises, but they would certainly not take over all outlets, as this would contradict their own business model. German buyers from the IAM parts distribution market have rather bad cards, as the antitrust authorities will examine an acquisition or participation and eventually impose conditions. This also applies to foreign companies that are already represented in the German IAM aftermarket, such as the Allianz Automotive Group. However, there are also arguments against a prohibition by the anti-trust authorities. The German IAM distribution is still too fragmented overall, so that foreign buyers that are not yet represented in the German market, such as LKQ, have a good chance. However, Mr. Gabriel’s Ministerial Decision regarding Schlecker relating to REWE/EDEKA has also shown that, if sufficient interests are respected, it is also possible to disregard the decision of the Cartel Office. There is nothing to be said against a financial investor or a minority stake. Market pressure in the IAM is now leading to developments similar to those of 35 years ago in the tyre market, when tyre manufacturers introduced controlled distribution and the business area expanded from pure tyre trade to car service. Not to mention the general development, which declares today’s car to be a “relic” of the past. Many car parts which generate sales are gradually disappearing (combustion engine, exhaust system, etc.). New parts such as the electric motor, new battery generations and, above all, “digital software solutions” are being added. All this could make it difficult for many established suppliers in the market to survive if it does not sweep them away completely. But this is not yet the case. There may still be a lack of capital, management, human resources and strategic resources for internationalisation and digitisation. o Is a sale worthwhile? o Would there be sufficient return through an investor or a share in order to master the coming challenges? Perhaps we simply do not want to miss the boat to continue to play in the top league of European supergrossists. Which part of Stahlgruber is affected? According to the press release, the Group holding company’s strategic considerations seem to extend to the entire Stahlgruber GmbH, both domestic and foreign subsidiaries. 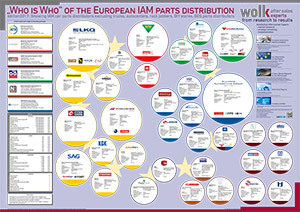 For those wanting to get an overview of the possible candidates from the field of common suspects, we recommend our poster about the biggest European independent parts dealers.